Actor Don Cheadle's forthcoming bio-pic Miles Ahead is set to star the celebrated actor in the eponymous role of seminal jazz musician and band leader Miles Davis, with Cheadle also serving as writer and director. The movie will take place in 1979, which was historically speaking a period of creative stagnancy for Davis in real life, with Ewan McGregor playing a persistent journalist who continues to intrude into the musician's privacy, before becoming criminally involved in an effort to secure a missing tape containing invaluable Jazz session music. The film is set to feature several bizarre and surreal flash-back sequences taking the viewer into and out of the past in order to assess the artistic import, and personal proclivities, of the man being portrayed. That being said, the first feature length trailer for the new film intimates plenty of the former description in spades. In the footage featured above from EW, Cheadle plays Davis with a menacing cool that threatens to linger into less than savory territory, as the film's featured protagonist threatens and needles his way into getting exactly what he thinks he deserves, regardless of the assumed criminality of his actions. Backed by the thumping, rhythmic heart of the music that made the man a legend, Miles Ahead looks to be a thrilling mad-cap adventure in the making, and should offer Cheadle the opportunity to explore new territory as an actor and a first time director. "Its freeform riffs on highs and lows from the musician's life are a fine example of structure emulating the ever-evolving style of an artist defined by unrelenting experimentation." "Cheadle maintains a convincing screen presence that holds the multiple strands together. The actor makes an uneasy transition to the director's chair, but his performative abilities enhance the movie's intentions." 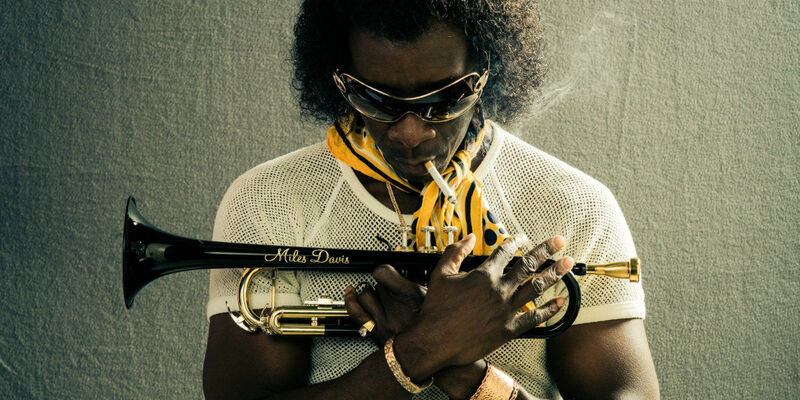 "Miles Ahead doesn't know what aspect of Davis' life is fit for a movie. It just knows he glows. Cheadle's commitment to expressing his unbridled creativity and violent flaws makes his attempt worth it." Whether or not Cheadle will be able to pull off his leading performance in the film in the eyes of general audiences (when the film arrives in April 2016) remains to be seen, though early word of mouth certainly paints a picture that's as compelling as the latest footage simultaneously appears to be. Either way, Cheadle is Davis in Miles Ahead, which should be something that fans of the actor and the real life musician can anticipate seeing in theaters. Miles Ahead will see theatrical release in the U.S. on April 1st, 2016.